It doesn't get much more beautiful than this. All the elements came together for me this morning at Rocky Mountain National Park's Bierstadt Lake. Named in honor nineteenth century painter Albert Bierstadt, the clouds, light, color and mountains looked very much like the elements Bierstadt used to create his paintings of the American West. 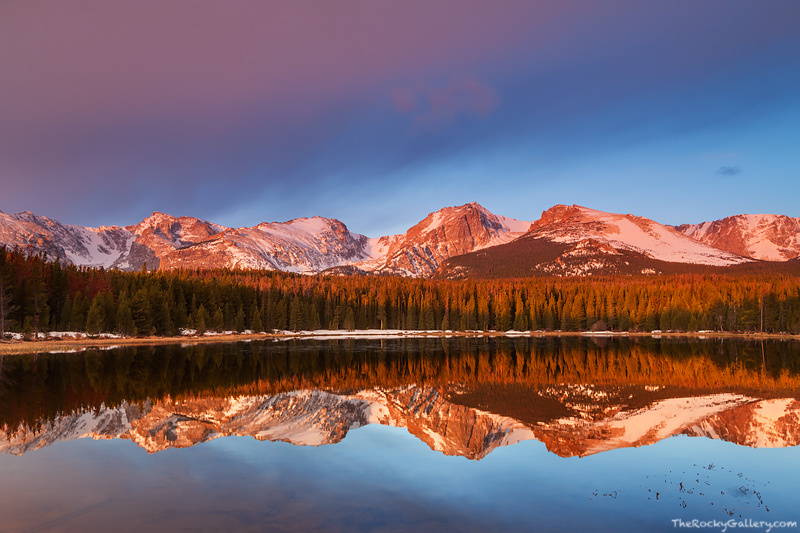 The view of the peaks of Rocky Mountain National Park are spectacular from Bierstadt Lake. Notchtop, Flattop, Hallet Peak, Otis and the edge of Thatchtop mountain all can be seen reflecting in Bierstadt Lake. Photo © copyright by Thomas Mangan.